The comforting, instantly recognizable image of one of our greatest presidents - on a bandage. Whether it's a scrape or a cut, Abraham Lincoln will heal your wound as he healed our nation. Comes in a 3-3/4" (9.5 cm) tall metal tin with a FREE PRIZE inside! That way, if Lincoln doesn't make you feel better, at least you got a present. 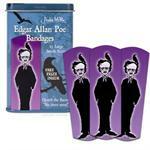 Each tin contains twenty 3" x 3/4" (7.6 cm x 1.9 cm) latex-free adhesive bandages with sterile gauze and the great emancipator. Quoth the Raven - No More Sores! 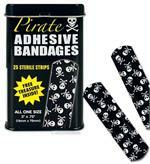 15 Latex Free Bandages for all sorts of boo boos. It's how Goths heal.